When I think of being a kid I think of three things: 1. No bills. 2. No work and 3. Pop-tarts. Unfortunately, I can’t go back to having no bills and not having to work, BUT I CAN go back to eating my beloved Pop-Tarts. Except, I don’t want no Pop-Tarts from a box. I want them hand-made and fresh from the oven. Clearly my old age has turned me into a Pop-Tart purist. If there is such a thing that is that is. And you know what? I am fully okay with that because these Pop Tarts? They get two thumbs and two big toes U-P.
And that is from 5 taste-testers. These adorable, flakey pockets full of gooey, sweet cream cheese are the BOMB. Do people even say that anymore? I guess we are talking about things from the past. Let’s go with it. PLUS they are, wait for it, pretty darn good for you! Minus the sugar. But, in my books, 1 ingredient out of eleventy billion doesn’t even count. You understand. 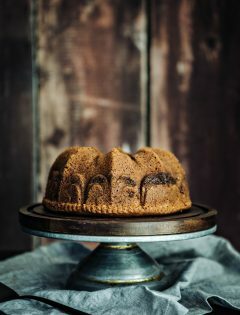 If that didn’t convince you, then maybe this will: Aside from being stuffed with a honey & cream cheese YUM-fest, they are also filled with satisfaction and the general good feelings that come when you CONQUER a recipe and make it from scratch. Like with your own hands. The things on the end of YOUR OWN ARMS. Those things. It’s a warm and fuzzy feeling. The same feeling that you get when you CHOMP into above mentioned homemade Pop-Tart. Minus the fuzz. No one likes a fuzzy Pop-Tart. The taste-testers that I mentioned earlier all said that the taste of these reminded them of a Ginger Snap Cookie. 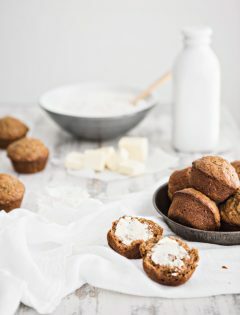 Basically this means that these would make a PERFECT Christmas-morning breakfast for both you AND your kids. They pair yum-a-liciously with both a glass of milk AND a cup of coffee. See? Happy you. Happy kids. With so much happy goin’ on, you would be a scrooge not to make them happen. Your Christmas morning depends on it. 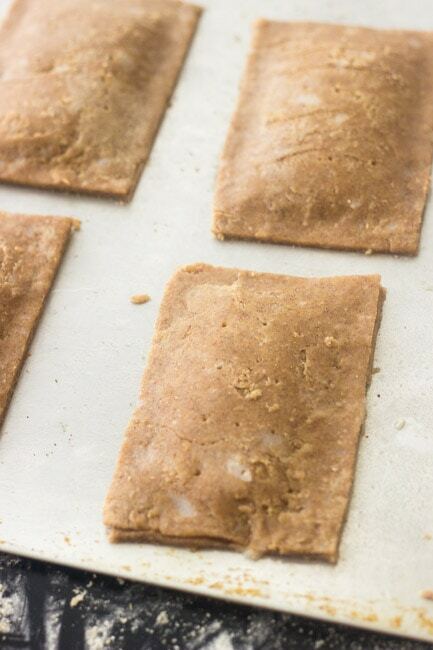 Have you ever tried to make your own Pop Tarts? 1. In a large bowl, stir together the flours, salt, ginger, cinnamon and brown sugar. Cut in the frozen coconut with a pastry blender, or your fingers, until the size of small peas. 2. Drizzle in 6 Tbsp of the ice water and mix until the dough just comes together, adding the remaining 2 Tbsp if necessary. Form the dough into two discs and wrap with saran wrap. Refrigerate for 20 minutes. Spread parchment paper on 2 baking sheets and set aside. 3. 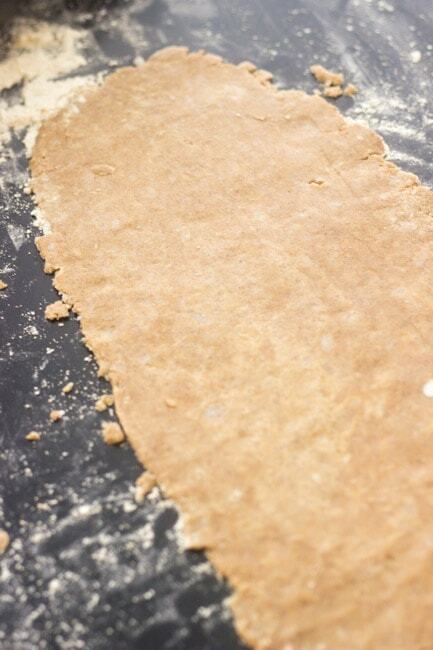 On a lightly floured surface and using a floured rolling pin, roll one of the discs into a 4 inch wide rectangle. 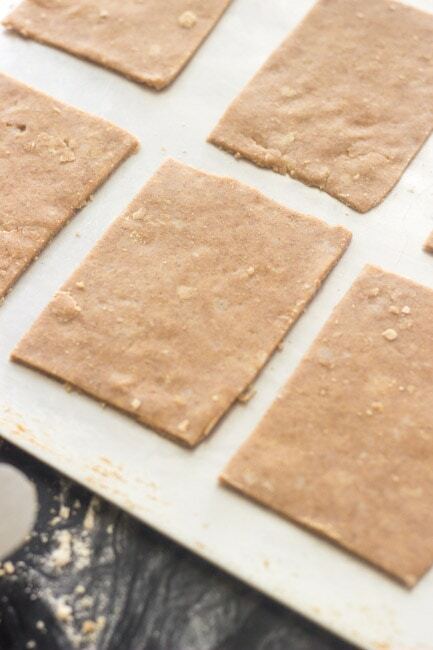 Cut the dough in 3 inch increments (so each piece is 3x4 inches) and place the squares onto a prepared baking sheet. Place into the refrigerator to chill while you repeat with the remaining disc. 4. Once the dough is cut into squares, combine the egg white and water in a small bowl and brush each square entirely with egg wash.
5. 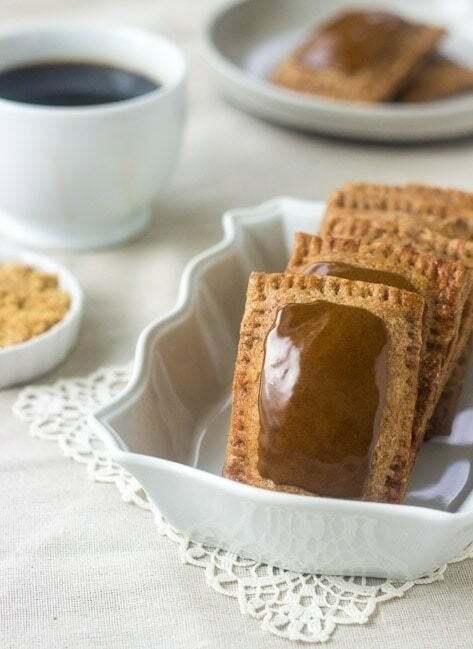 Combine the brown sugar spread ingredients in a small bowl and spoon ½ Tbsp onto the middle of each square, spreading gently and leaving about ¼ of an inch around the perimeter of each square. 6. Whisk together the filling ingredients in a small bowl until mostly smooth (a few little lumps are perfectly fine) Drop the filling by 1 Tbsp balls onto the center of half of the squares and lightly spread out, leaving about ½ inch around the perimeter. 7. 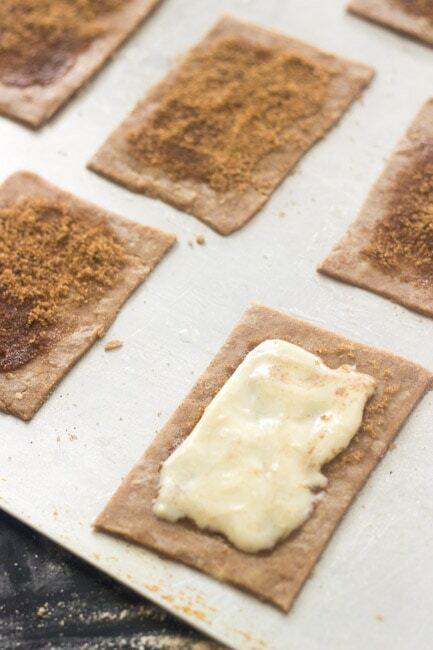 Cover each cream cheese covered square with one of the squares that only have the brown sugar spread (spread side down) and firmly press around the filling to seal it in. Use a fork to press along the outside of each pop tart to crimp the edges and real seal it in. Then, use a toothpick to poke 9 little holes in the top of each pop tart so that air can escape while baking. Place into the freezer for 30 minutes to firm up the oil and filling. 8. Preheat your oven to 350 degrees while the pop tarts freeze, and then bake for 25-35 minutes until golden brown. Let cool for 5 minutes on the pan, and then transfer to a wire rack to finish cooling completely. 9. 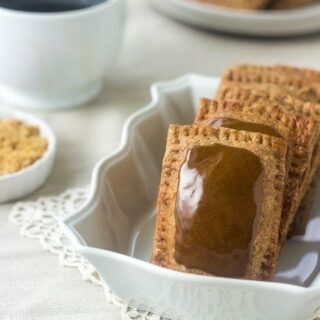 Once the pop tarts are completely cooled, whisk together the glaze ingredients and spread over each pop tart. The glaze will harden after about an hour. Hmmm pop tarts. I discovered these in my teenagers life, kinda late, huh? And I’m glad to see a homemade pop tarts recipe so I can recreate my teenage years. 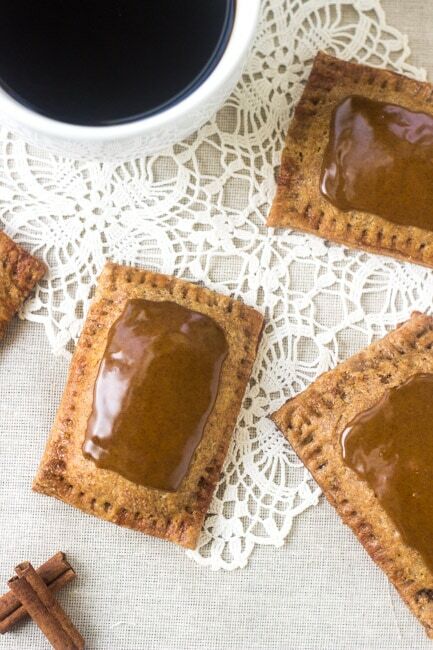 Oh man, homemade poptarts for fall?! I am sooo there! These are epic! They look so good Taylor! Oh my these are so drool-worthy! Love the sound of that filling! Scrumptious!